Heavenly blog! : No. 805: Why are Christians so uncritical towards funds and especially about the TV which is a huge and gigantic money, the! No. 805: Why are Christians so uncritical towards funds and especially about the TV which is a huge and gigantic money, the! Why are Christians so uncritical towards funds and especially about the TV which is a huge and gigantic money, the! Although AS Norway yesterday with a thumping profit, then Nevertheless it spending and the funds Christian Norway relatively sparse up against the monetary sums Norway AS operates. Why then when they actually encourages very limited funds among the believers is so little critical up against the money come believer later? Not least among the Christian television actors actually now become the "tops" among the Christians when they apply to get money and what one takes into wages. Photo by Jan Hanvold which is in my opinion a real scam that has managed to flea the Norwegian Christendom for 100 Million a year as Vision Norway has a year in revenue. With other 100 Million right on account of a false prophet. Money and funds that could and should have been used quite differently. My experience is that there are very limited funds among Christians, especially set up against society! These Christian TV stations which basically is more to enjoy for the people of God, than it is an evangelistic tool need money very much money. Not only that, it's not any insight into what they really need the money and what money has been used in the vast and all. And what they will be used. But this "fixes" the fort. They make up a photo that an industrial building from Moldova or some poor children in Africa. It touches SENSE TO LIFE HAPPY AND WILLING DONORS! THEN GIVE AWAY A FREE! But what about those who conveys this? They live very often in a pity to be re-married or otherwise is contrary to Scripture. Who supports if one gives to these TV channels? As I see it, plunge least not God and God's work. But maintaining something that fundamentally is under God's judgment! Being a "saved" by evangelize and distribute food etc.? then I have nothing won. When Jan Hanvold do "much" good and take out salary of 2-3 Million. Who is feeding him really as if he is living in sin? Actually this is not anything that painter's own cake. And build an "empire" for themselves and their families. This is you with support and keep alive if you give these TV channels here in Norway. You do not really support the cause of God, but people who are under the judgment of God with his life! My experience in Christian Norway is that there really is something to aim for is mostly uphill. It is not worth betting on, it goes downhill and being wagered. My experience of the world is the exact opposite. It is really something to aim for, it is focused on. What is not really something to aim for, being ignored and neglected. Luke 16: 8 The LORD gave the dishonest manager praised because he had acted wisely. For children of this world work out wiser with each other than the children of light does. 9 I say to you, Get you friends using the dishonest mammon, that they may receive you into everlasting dwellings when the money runs out. Noting that Christensen here is quite alone in his views and you loose bursts at him as if he is fair game? How can you so called "good Christians" give such unconditional support to ministers and leaders fornicators ???????????? Perhaps brother Jan Kåre could have used a little milder word about it, but in case he's 100 percent right. The Bible condemns remarriage, and when Christensen is now being attacked, condemned, criticized and denigrated in such a way, then it is religious persecution. Instead, would you have supported the Jan Kåre's important commitment towards remarriage. You here is the fact the party of the devils whore! Think about it! I wrote earlier that I gave my full support to Jan Kåre Christensen and believes that the attacks on this servant of God did not testify that you are of a different spirit. Jan Kåre is strong has managed to stay upright throughout this debate, and not a single one of you have managed to get you to Jan Kåre arguments. 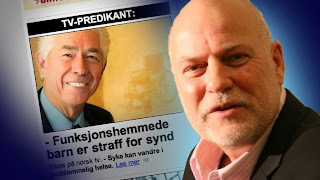 He preaches God's clear word about remarriage and make right when he reveals as hypocrites January Hanvold, Bjørn Storm Johansen, Jornstrand and the others he has revealed. Christensen's blog is a fresh wind pus from the sky, as you dodge screaming like the people of Sodom. Turned off blindness are you all. I think hardly a single one of you is saved. Clearer than this can hardly be said? In any case, think and pray to God who to support and who not to support. Do not just look blindly on the needs and who supposedly "help". But ask for God's guidance every day in all things in life. Not least who to support and stand with the service! The fact that Norway needs a Christian TV channel is okay. But it is sad that this man is the boss of the channel. He is divorced twice and married for the third time. Is there something in the Bible also that no distinction should be leaders. Constructive criticism is not judging. We can not just accept everything without speaking up. You can google the Hanvold itself. Where you get the information you need to make up your mind. I do not change the meaning, even if we two do not agree. What you think does not interest me. I have my opinion and you can have yours. I still say that it is sad that this man is the head of the channel. The truth can be painful to swallow. Worse, when one is unable to see it.